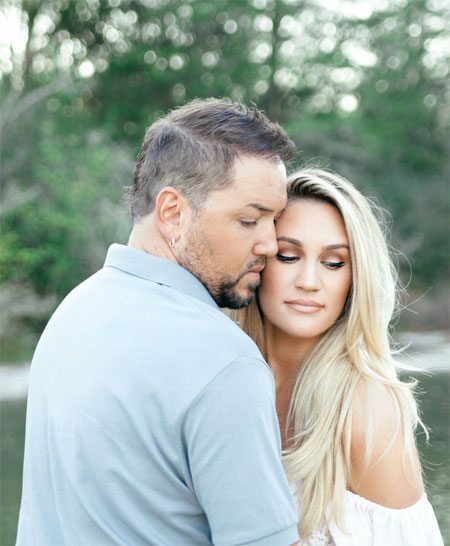 Brittany and Jason Aldean will be having their first child together any day now, and they just posted some truly sweet maternity pictures. The photos are romantic and intimate, showing the couple in tender embrace and walking in the country. Brittany dons two different long flowing white boho dresses for the photo shoot. One is off the shoulder with eyelet lace. She also wears one that has peasant sleeves and colorful patterns. The style looks gorgeous with her baby bump. The Aldeans are naming their baby boy Memphis in recognition of Jason's Elvis obsession. Elvis lived in Memphis from the time he was 13 years old. It's also the location of his famous mansion and final resting place, Graceland. Jason and Brittany Aldean have been really open about sharing their pregnancy journey with fans. They previously shared pictures of their baby shower and their baby's adorable nursery. Brittany was also open about her worries about the baby's future while escaping the gunfire at the Route 91 Harvest Festival. Memphis is the third child for Jason, who has two daughters from his first marriage, but it's Brittany's first born.